Your shoulders are the most movable joints in your body. And because of that they are also often unstable. The shoulder and neck are often taken together because the shoulder and neck often have interrelated conditions.To remain in a stable or normal position, the shoulder and neck must be anchored by muscles, tendons and ligaments. 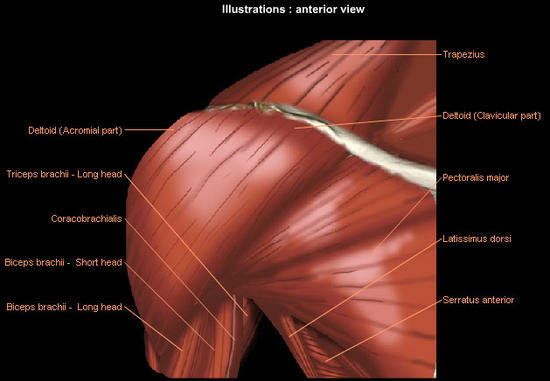 Because the shoulder can be unstable, it is the site of many common problems. They include sprains, strains, dislocations, separations, tendinitis, bursitis, torn rotator cuffs, frozen shoulder, fractures and arthritis. Rolfing is a systematic programme of postural repatterning that seeks to bring your body back into alignment. Thus Rolfing continuously seeks out a dynamic, creative balance in your body that is quite different from holding it in one rigid postural position. Rolfing sees the body and its structure as a series of interconnected and inter-related bony segments. Your body is designed to provide internal support for all these segments. Large sections rest on sections below them and provide support for sections that are above them. To understand how Rolfing treatment for the shoulder works, it is important to recognize that the shoulder injury cannot be understood by looking at the shoulder alone. The shoulder and neck rests on the thoracic/cervical spine, and hence these two interconnected segments must be treated together. As you walk into the clinic, the Rolfer will assess your posture to ascertain if there is any imbalance or underlying conditions in your body, especially your shoulder or neck that contributes to your shoulder difficulties. Once this is done, the Rolfer will use his elbows and knuckles on the myofascia to release tension in your shoulders at the fascial level. The underlying principle of Rolfing is that injuries, poor movement habits, and chronic muscle tension from stress cause the fascia to stiffen. Fascia is the tough, densely woven connective tissue which spreads continuously throughout the body in a three dimensional web from head to foot. Rolfing is designed to loosen the fascia, resulting in a freedom in muscle movement and unlearning of bad patterns of muscle strain and misuse. This is done via a treatment called myofascial release. Rolfers incorporate a range of soft tissue massage techniques that release the motion restrictions that impede whole body organization. Mobilization of the shoulder joint is helpful in treating frozen shoulder. Fascia of the surrounding muscles is targeted for loosening, including muscles that attach at the clavicle, or collar bone, leading up to the neck. Also addressed would be muscles surrounding the shoulder blade and neck. A successful result is the lengthening of the muscles and increased range of motion of the shoulder joint. Rolfing’s great strength is that it is non-invasive, and hence while undergoing Rolfing you will be able to continue with your sports, while simultaneously relaxing the muscles around your shoulder, which will allow you a greater range of movement around the shoulder and neck and increase your flexibility. Rolfing also addresses the muscles surrounding the shoulder and neck including those in around your chest and your ribcage.